Note: This article was first published September 20, 2014 by Crux. With the appointment of Blase Cupich (pronounced “SOUP-itch”) today as the new Archbishop of Chicago, one can say that the Francis revolution in Catholicism has finally arrived in the United States. Up to this point, one could have made the argument that the change triggered by Francis is largely a matter of a new tone and style in Rome, but one that had not yet reached down and begun to alter the culture of the church on these shores. With the appointment of the 65-year-old Cupich, however, the American landscape has shifted. This is the fourth appointment Francis has made to a major archdiocese since July, following earlier choices for Cologne, Germany; Madrid, Spain; and Sydney, Australia. Each pointed a direction for the church in those countries. By now, the profile of a “Francis bishop” has come into focus: Ideologically, moderates rather than hardliners; pastorally, men who place special emphasis on concern for the poor and those at the margins; and personally, leaders who aren’t flashy personality types, with a reputation for being accessible and hands-on. In some ways, those are precisely the sort of leaders perceived to have been out of favor in the American hierarchy during the late John Paul II and Benedict XVI years, but with Francis, the dynamic has changed. Chicago is on a short list of pace-setter dioceses around the world whose leaders help set direction for the church in their regions, and it’s long been a bellwether for deeper realignments. During the 1980s and 1990s, the late Cardinal Joseph Bernardin embodied the moderate, reforming spirit of the Second Vatican Council. The transition to Cardinal Francis George embodied the stronger emphasis on Catholic identity in the later John Paul II years, with the effort to resist the inroads of secularism in the faith as a defining cause. Bernardin famously called for a “seamless garment” ethic in Catholicism, one that placed equal emphasis on opposition to war and concern for the poor alongside opposition to abortion. George, meanwhile, helped make the defense of religious freedom a signature cause for the American bishops, crystallized in the tug-of-war between the bishops and the Obama White House over contraception mandates imposed as part of health care reform. Both Bernardin and George served as president of the U.S. bishops’ conference at different points, and both were seen as representing the broader spirit of their era in the American church. With Cupich, Francis has found another tone-setting prelate to take over in Chicago. Among other things, the appointment puts Cupich in line to become a cardinal the next time the pope creates new Princes of the Church. Cupich is clearly a moderate, clearly upholding church teaching on all the hot-button issues in the wars of culture such as abortion, contraception, and gay marriage, but like Francis, he tends to shun strong rhetoric on those matters. Instead, Cupich has been identified with the wing of the American bishops that’s tried to steer the church down a less confrontational path, and tends to place special emphasis on the social gospel, meaning concern for the poor and for social justice. In 2011, for instance, Cupich dismayed some of the most aggressive pro-life forces in Catholicism when he discouraged priests and seminarians in Spokane from praying in front of Planned Parenthood clinics as part of an anti-abortion protest, seeing the gesture as unnecessarily provocative. Cupich is also seen as an adept manager and an internal reformer who has helped lead the American church’s efforts to recover from the child sexual abuse scandals from his role as chair of the U.S. bishops’ Committee for the Protection of Children and Young People. On a personal level, Cupich is regarded as humble and open, precisely the sort of pastor who “carries the smell of his sheep” that Francis has said he wants. Pope Francis was personally involved in the selection of a successor to the 77-year-old George, making phone calls to a wide variety of sources in and around the American church and also consulting American prelates when they came to Rome. In those conversations, sources say, Francis asked for blunt assessments of the strengths and weaknesses of a variety of candidates. One American cardinal said on background recently that he had been surprised when Francis asked him for an assessment of Cupich, since the Omaha native was not generally regarded as a front-runner for position. The cardinal said he got the vibe at the time that Francis was seriously considering Cupich, an intuition that clearly turned out to be correct. Whether Cupich turns out to be another Chicago heavyweight who puts a stamp on his era remains to be seen, but one could make a strong case that the “Francis era” in American Catholicism begins today. Pope Names Cupich as Next Chicago Archbishop – Rachel Zoll (Associated Press via Yahoo! News, September 20, 2014). Blase Cupich – Champion of Social Justice – is the Next Archbishop of Chicago – Christopher Hale (Millennial, September 20, 2014). There May Be Brighter Days Ahead for LGBT Issues in Chicago Archdiocese – Bob Shine (Bondings 2.0, September 20, 2014). Blase Cupich of Spokane Named Archbishop of Chicago – Dennis Coday (National Catholic Reporter, September 19, 2014). 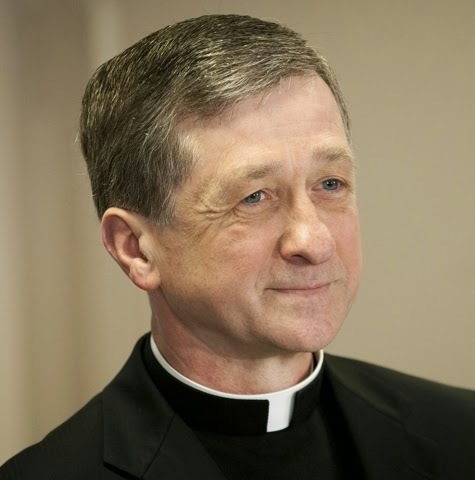 New Chicago Archbishop Blase Cupich: A Moderate Voice – Michael O'Loughlin (Crux, September 19, 2014). Pope Francis Names Spokane Bishop to Chicago, Dashing Conservative Hopes – David Gibson (Religion News Service, September 19, 2014). Cupich to Chicago: What It Actually Means – Thomas Peters (CatholicVote.org, September 19, 2014).